Going Green? Our heavy-duty Eco friendly Bamboo chopping board can be fire-branded with your imprint, and will be used and appreciated daily. 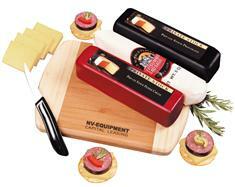 We include seven-ounce blocks of shelf-stable Provolone and Mild Pepper Cheeses, tangy Beef Summer Sausage, and a cheese knife to help get them started!